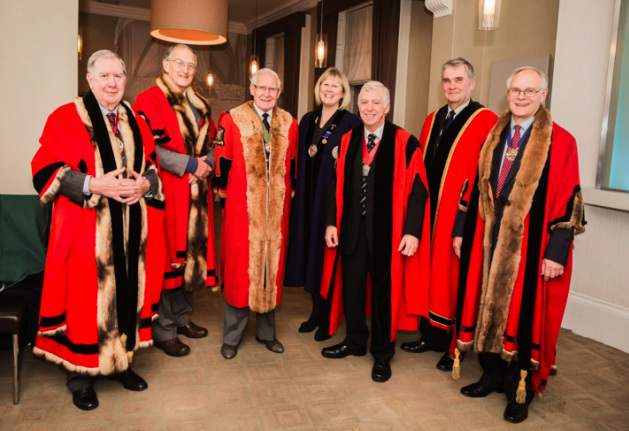 The seven Masters of the York Gilds initially attended a reception at the Dean Court Hotel before processing to the Minster (see photo, from left to right: Fred Brown (Merchant Adventurers); Tom Kettlewell (Merchant Taylors); Alec Stephenson (Freemen); Rebecca Thompson (Building); David Hobman (Cordwainers), Tim Hinton (Scrivenors); Jeremy Selman (Butchers). 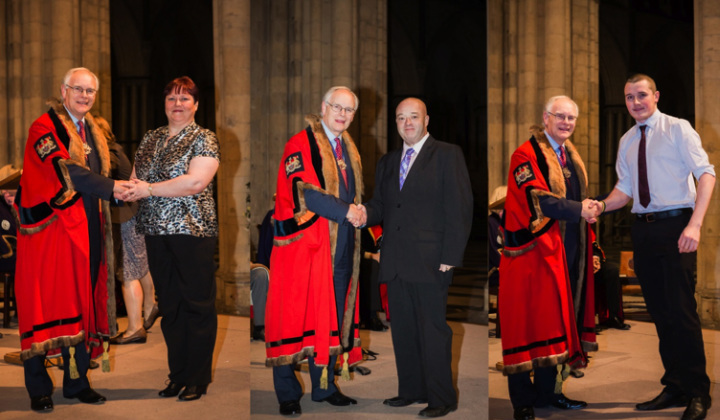 The historical atmosphere provided by the Minster, and the presence of the Gild Masters, certainly created a great sense of occasion for the ceremony. 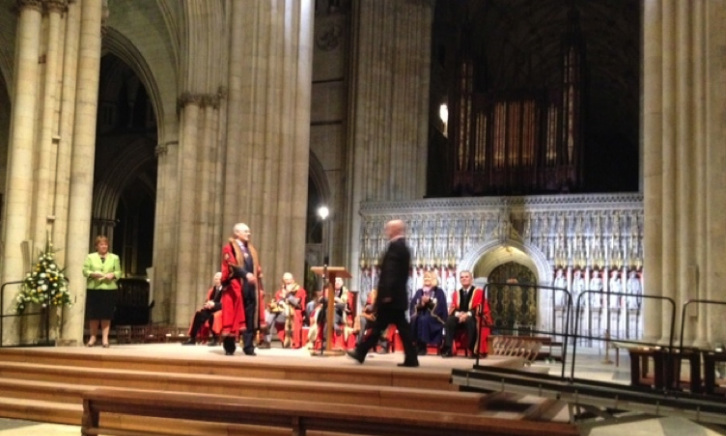 Each Master took it in turn to congratulate about 20 apprentices as they walked across the stage to collect their certificate (see photos). During the ceremony, several speeches were made including an inspirational one given by the celebrity hairdresser Andrew Barton. He had started out as an apprentice hairdresser in Barnsley, and now has a famous Salon in London, was the hairdresser on the TV Programme ‘10 Years Younger’, has styled the hair of many celebrities, and sells his own hair care product range through Asda. One of the lessons he learned as an apprentice was that if something he has done is ‘alright’ then it isn’t – continuous improvement and the pursuit of excellence are keys to success. 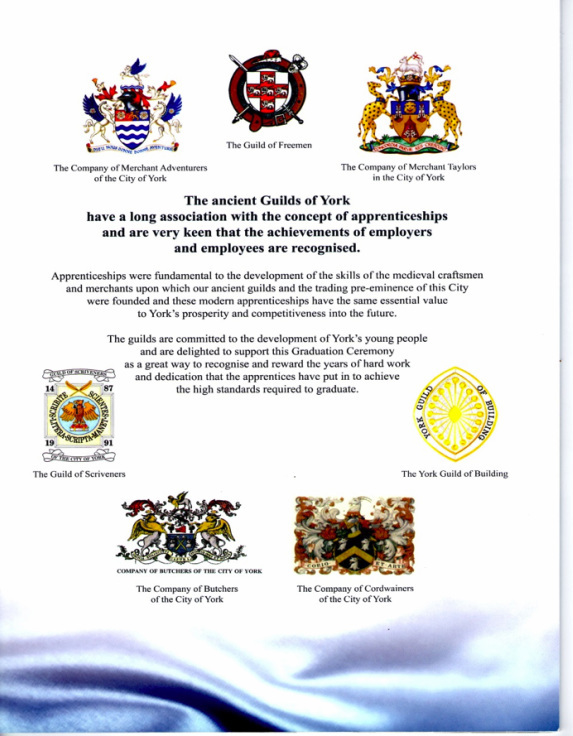 This ceremony was an extremely worthwhile occasion for the Gilds to honour the achievements of these apprentices, and to endorse the benefits of the apprenticeship scheme for both individuals and companies. 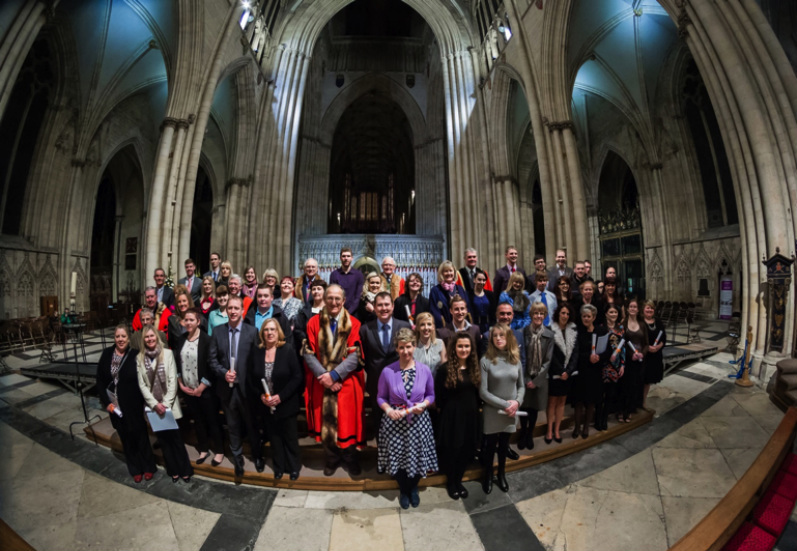 The evening ended with a photo opportunity for groups of the apprentices in this wonderful setting (see photo).